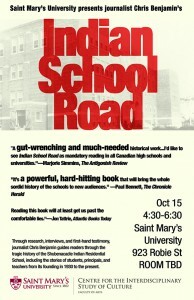 Thursday, October 15 at 4:30 pm, Saint Mary’s University presents Chris Benjamin, journalist and author of Indian School Road: Legacies of the Shubenacadie Residential School. Where? At the Loyola Academic Complex (5865 Gorsebrook Avenue) - Room 175. Through research, interviews and first-hand testimony, journalist Chris Benjamin guides readers through the tragic history of the Shubenacadie Indian Residential School, including the stories of students, principals, and teachers from its founding in 1930 to present.